Editor’s note: Astrobites is a graduate-student-run organization that digests astrophysical literature for undergraduate students. As part of the new partnership between the AAS and astrobites, we will be reposting astrobites content here at AAS Nova once a week. We hope you enjoy this post from astrobites; the original can be viewed at astrobites.org! Authors: K. Basu, M. Sommer, J. Erler, et al. Galaxy clusters are among the most massive objects in the Universe. Some contain thousands of galaxies, with well over a trillion stars between them. And that’s only 5% of a cluster! The vast majority (around 85%) of a cluster’s mass is made up of dark matter. The remaining 10% is hot, very low-density gas (plasma) called the “intracluster medium“, or the ICM. We can weigh all the components with a variety of observations. The stars in galaxies are visible at optical wavelengths, while the hot ICM emits X-rays that can be observed with satellites like Chandra. It’s more difficult to measure the dark matter, which by definition doesn’t emit light. But the technique of “weak lensing” — measuring how the dark matter gravitationally distorts the light coming from background galaxies — gives us a rough estimate of where the dark matter is. In a normal cluster, the three components (galaxies, ICM, and dark matter) all lie on top of one another. But when two clusters collide, the components can separate. Dark matter only feels the pull of gravity, but the ICM also experiences friction and gas pressure. The dark matter components whiz past one another while the ICM sticks together, as in the famous example of the Bullet Cluster, shown above. It’s like if two water balloons collide: the rubber (ICM) stays put in the middle, while the water (dark matter) is free to keep flying past. The authors of today’s paper are catching this process in action. Specifically, they measure the shockwave in the ICM gas from the collision of two galaxy clusters, in “El Gordo”. The ICM, like any gas, has a natural sound speed (which depends on its temperature). When gas moves faster than its sound speed, it creates shockwaves, where the pressure builds significantly and the gas is superheated. This same process is what creates a sonic boom on Earth. The authors combined two techniques to get the best constraints on the properties of the shock. First, they used X-ray measurements from Chandra to locate the shock as the brightest, hottest portion of the ICM (Figure 2). The hot ICM plasma can distort the light coming to us from the Cosmic Microwave Background, which is called the SZ (Sunyaev-Zeldovich) Effect. The authors added SZ measurements from the new ALMA radio array, which allowed them to precisely measure the gas pressure inside and outside the shockwave. The authors generate a model of the shock which is designed to match the two sets of observations. This is shown in Figure 3. 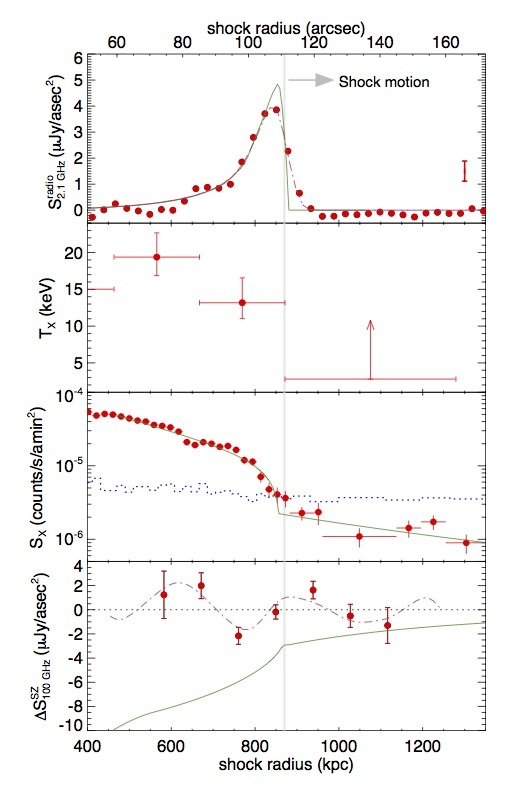 The observations show a sharp peak in radio emission and X-ray temperature, which confirms there is a shockwave that is heating up the ICM. By comparing different models of the shock, the authors derive a “Mach number” M≈2.4, which says the shockwave is moving at 2.4 times the speed of sound. That’s quite a sonic boom, particularly given that the speed of sound in the hot plasma is around 2 million miles (3.2 million kilometers) per hour! While this is not the first time astronomers have measured shockwaves in galaxy clusters, this is the oldest shockwave we’ve ever found. El Gordo is located about 7 billion light years away, which means we are seeing the shock happening when the universe was only half as old as it is now. 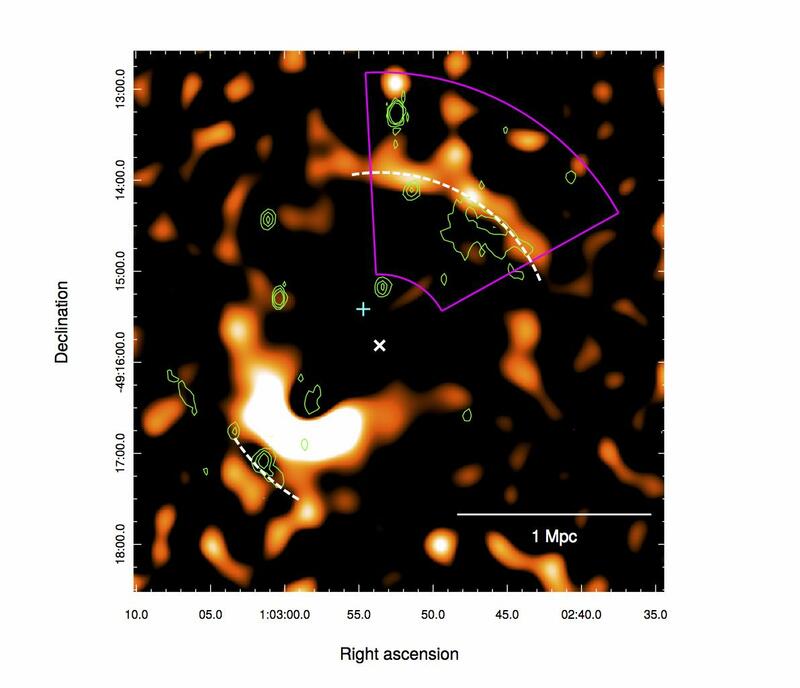 With the new capabilities of ALMA, observations may be able to start seeing even farther back and see the shocks created by the formation of the very first galaxy clusters. I’m a second year astronomy grad student at Harvard and currently study the merger and accretion histories of galaxies in simulations. I’m also interested in data science, and how machine learning can be used in astronomy. I received my bachelor’s degree from Princeton, where my senior thesis investigated the distribution of baryons in a large range of dark matter halos.